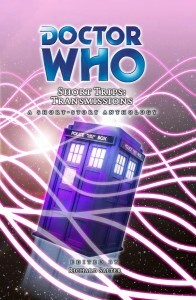 Short Trips: Transmissions is a short story collection I edited, released in 2008 by Big Finish Productions. On this page you will soon be able to find out how it came into being, how the collection was put together, learn about the writers involved, read some reviews and also check out some alternative cover art. Oh, and if I’m drunk enough I might talk about what a total bugger it was to write the final story in this collection, Transmissions Ends. Yeah, I am officially my own worst enemy.